An internal circular from my company this morning when I waltzed into work at 11:00 am. The victims were located a mere stone's throw away from where my company is so I felt saddened by this invasion of property and traumatic human casualties. 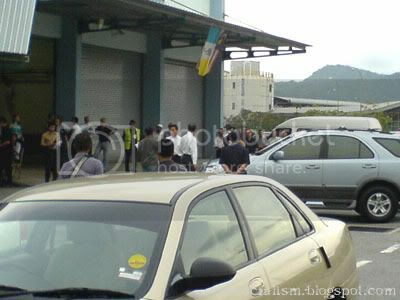 Today (20/11/06) at about 2.00am the BAX Global Penang airfreight gateway at KLAS-Penang was robbed by a gang that was dressed neatly with a black suited armed with parang machetes. They also have covered their faces with a full-faced mask. The Black suited gang (about more then 30 of them) entered KLAS Cargo Terminal hiding inside trucks, two 40' footer trucks. Once this truck arrived at BAX Global's gateway warehouse, one of the gang members, pretending to be the driver opened up the truck door. 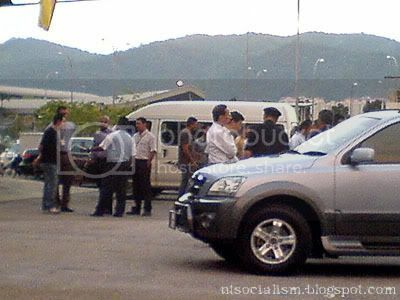 Immediately the rest of the gang members who were hiding inside the truck sprung out with parangs and started to slash some of the Bax workers and the Cargo Connection (cargo build-up vendors) workers who were busy performing their task at that point of time. All the Bax workers & Cargo Connection workers were forced to drink a kind of liquid that is suspected to be a kind of chemical that is similar to sleeping pills. They victims) were also given chloroform to make them sleep deeply. Once this is complete some of the gang members went around this victims and started to kick them to acknowledge whether they are still alert or have already slept. Then a few of the gang members started to tie all this victims with an insulating tape (used to insulate wires) to ensure they do not react in case they are alert. Once all the victims were taken care of, the gang members immediately started to load the 39 pallets of Intel goods to both the trucks and also damaged the phone wires and took the CCTV DVR's and left the premises. Once the truck arrived at the KLAS-MAS check post, immediately a group of the gang members jumped down from the truck and attacked the MAS Security Officers who were on duty and injured them, including breaking the guard post glass and left the area. It was expected the gang members left the area somewhere 3.45 am. There were nobody to help the situation and one of the BAX workers who got back the conscious at about 5.00am called the police and the police came to the spot at about 5.15am and rescued the victims. Out of 11 victims (at the point of receiving feedback from BAX personals) two of the BAX workers are very serious in hospital resulting from the parang slashes. 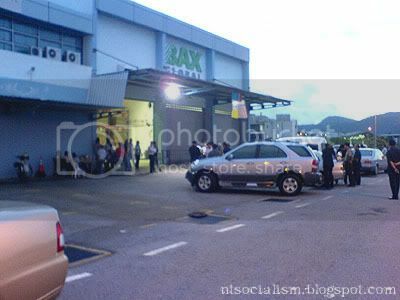 The Robbery Gang is believed to be Malays from the victims' statements to the police. Also the victims informed that there were two SUV's (believed to be Toyota-made) were going up and down the exterior road for a couple of times. This was noted by the 'Freight Watch Security' personnel (xxxxxx). Also he added that the gang members were communicating by walkie-talkie to their other members on the progress of the robbery activities. The police are still in the midst of investigating this case. Sir looking at this situation, we need to have tighter security, as this is very serious. We are also catering INTEL shipments and we need more Security forces to be assigned with armed in the CARGO Security Check Post, terminals and at the airfreight surroundings. Including performing frequent security rounds by MAS Security. Appreciate if we can have a meeting with MAS Security on this matter to raise our concern. 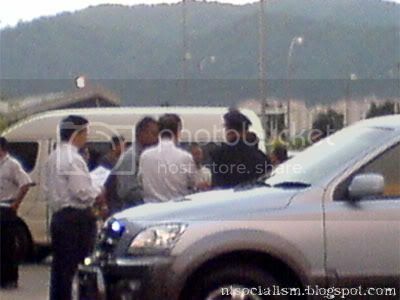 intel, bax, klas, robbery, heist, hijacking, batu maung, bax global penang. This email is intended only for the use by the party to which it is addressed and may contain information that is privileged, confidential, or protected by law. If you are not the intended recipient, you are hereby notified that any dissemination, copying or distribution of this email or its contents is strictly prohibited. If you have received this message in error, please notify the sender immediately by replying to the message and deleting it from your computer. Well, this heist is professionally done. I'm expecting the dailies tonight and tomorrow morning to feature a more detailed piece about this incident. 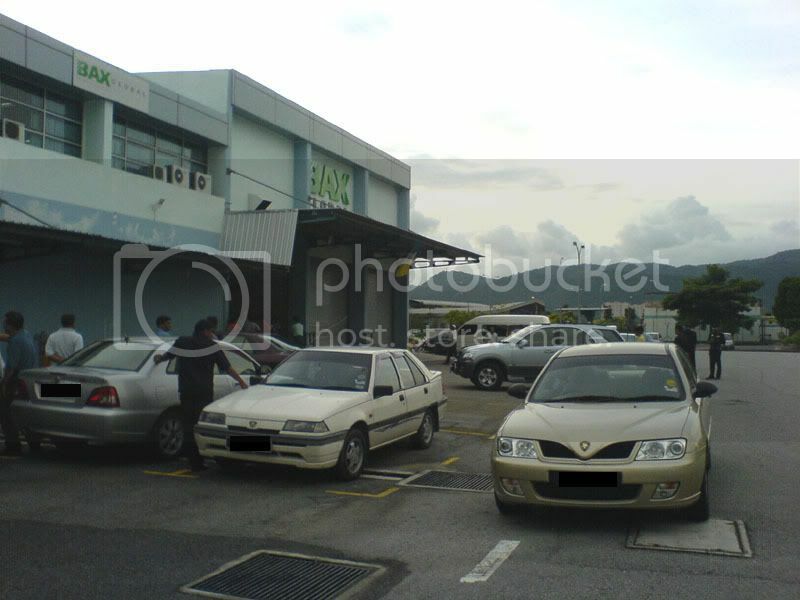 The street value should be estimated at MYR 13,000,000.00 (47 million ringgit) although that may be marked up to cover insurance claims and what not. Updates to be posted as they are flashed out in the papers. - Word of mouth claims that the Police Department has already detained three suspects; one from Balik Pulau, one from Sungai Pinang and the third yet to be identified. - Penang Chief Minister Tan Sri Dr Koh Tsu Koon and Director of Criminal Investigations Department (CID) Datuk Christopher Wan Soo Kee; who coincidentally said exactly 1 month ago in October that he is focused on bring organised crime down, visited the premises at approximately 1700 hours today. After a rather lengthy discussion and conversation with the owners of the warehouse and police department, the crowd and media crew dispersed at about 1910 hours.